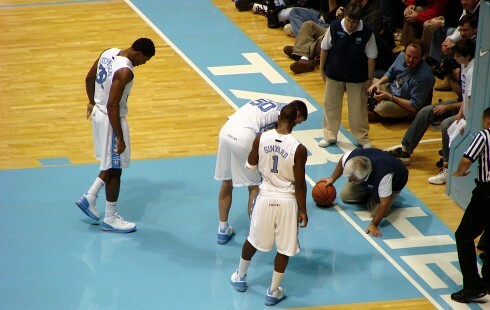 On Sunday night, Carolina lost their second game of the season to Wake Forest by a score of 89-92. Carolina is tied for last place in the ACC with Georgia Tech with zero wins and two losses. Statistically, it’s easy to see why UNC lost this game. They shot a pathetic 35% to Wake’s 46%. On their way to that woeful shooting percentage, Carolina took 23 threes and only made six of them. Great offensive rebounding and foul shooting were the only things that kept the game close. But aside from the numbers, why did Carolina lose the game? I think it’s a simple case of over-confidence, the same problem they had in their other loss to Boston College. Carolina thinks because they’re so talented they can turn on the jets anytime they want, and coast through the rest of the game. That might have been true early on when UNC faced relatively weak teams out of conference. However, ACC teams are a different breed altogether. Versus Wake Forest, it seemed as if Carolina decided to ease their way into the game, and by the time they realized the fight was going to be tough, they had worked themselves into a major funk. But I’m just an amateur sports writer, what do you all think? This entry was posted on at 8:55 am, filed under Sports and tagged basketball, Carolina, College Basketball, Georgia Tech, UNC, Wake Forest. Bookmark the permalink. Follow any comments here with the RSS feed for this post. Both comments and trackbacks are currently closed. I didn’t see the game, and all the highlights were of WF’s guard shredding UNC. I was listening to ESPN Radio and everyone was piling blame on Hansbrough though. Some people called for his benching in favor of a freshman, with one of the commentators agreeing that Hansbrough coming off the bench would make UNC a lock for the title. There was a lot of complaining about his taking of a 3 point shot at some point. He must have had a real stinker for people to go from overwhelming praise to this. he took a 3 late in the game and missed badly. I’m not sure how I feel about this… there was probably so much ego involved that it affected his shot, as he’s a great free throw shooter with good shooting form and has hit limited 3s in the past. I don’t know how confident he was when he took it though. if it were against Duke with a lead it would have gone. anyway what’s up with that photo? just trying to convey an overall sense of dismay? it’s not even the right game. People were criticizing him saying that he only tries to get fouled so he can go to the line. They claim that without all his trips to the line he’s not that great a scorer. If I was going to blame the game on any single player, it would be Lawson. He got torched by Wake’s guards, and seemed to do nothing but commit turnovers and miss shot. As for Tyler’s 3 pointer, I don’t think it’s a big deal. If you ever get to see him warm up before a game, he hits a ton of 3s, it’s just not what Carolina needs him to do during games, so he doesn’t get a chance to show it off. You’re exactly right about my motivation for picking that photo. to be honest, I don’t think he has to try too hard to get fouled. it just sort of naturally happens the way he convulses towards the basket. also people just hate him.